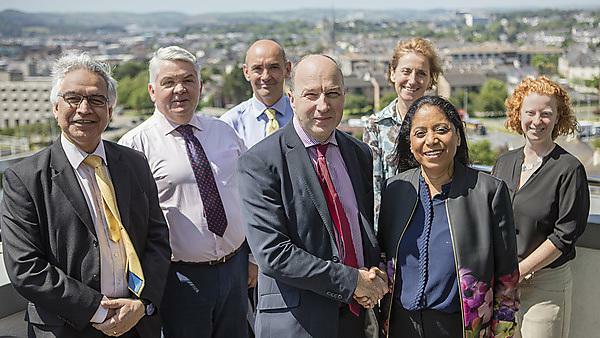 The University of Plymouth has entered into a partnership with leading postgraduate health teaching organisation Rila Institute of Health Sciences, London, to validate and deliver 11 medical programmes. The programmes include postgraduate diplomas for cardiology, dermatology, diabetes, ENT, family medicine, geriatric medicine, minor surgery, musculoskeletal medicine/rheumatology, ophthalmology, acute medicine and urology. The new arrangement adds two new programmes (geriatric medicine and acute medicine) to the Rila offering which had previously been delivered and validated by Middlesex University. The programmes will be delivered remotely and run from Rila’s main hubs in London, India and the United Arab Emirates. Key involvement from the University of Plymouth has been from Mark Glasson from Academic Partnerships and Dr Adele Hill from Plymouth University Peninsula Schools of Medicine and Dentistry (PUPSMD).